The Reading Viaduct (commonly called Rail Park) is a neighborhood rail park built on an abandoned railroad viaduct in Philadelphia which carried part of the Reading Company's Ninth Street Branch. Originally it opened in 1893, and was built by the Reading Company as an approach to the new Reading Terminal. The viaduct heads north from Reading Terminal and at Callowhill Junction, forks, the 9th Street Branch formally merging with the current SEPTA line. Except for a gap caused by the construction of the Vine Street Expressway (I-676/US 30), and a few blocks at the north end, the viaduct still exists. At Callowhill Junction, the City Branch turns west to join the former Reading Company main line at Belmont Junction. The viaduct and City Branch have been opened as an elevated park similar to the High Line in New York City. The Philadelphia and Reading Terminal Railroad was incorporated on April 13, 1888, leased by the Philadelphia and Reading Railway on May 1, 1891, and soon began construction. The viaduct and terminal opened on January 29, 1893. In 1984, the Reading Terminal closed, and Philadelphia's Center City Commuter Tunnel opened. The trainshed was incorporated into the Pennsylvania Convention Center. 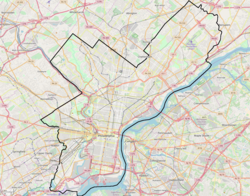 The main line of the Philadelphia and Reading Railway (originally the Philadelphia and Columbia Railroad and Northern Liberties and Penn Township Railroad) came into Philadelphia on the southwest side of the Schuylkill River and crossed at a point northwest of downtown (this line is now used only by freight). It then passed into a tunnel under Pennsylvania Avenue and turned east just north of Callowhill Street. The original alignment turned south along Broad Street, with a passenger station at Broad and Vine. The line continued east past Broad Street for freight to the Delaware River, using Willow Street. The passenger station was later moved to half a block east of Broad Street, on the old freight line. The spur from the new viaduct was later built from the line just east of this station. The other Reading line, originally the Philadelphia, Germantown and Norristown Railroad, and now used for passenger service by SEPTA, ran north on 9th Street from the east-west line on Willow Street. Its passenger station was at Mount Vernon Street, again where the new viaduct merged with the old alignment. ^ "Rail Park". readingviaduct.org. Retrieved 2016-08-24. ^ "Rail Park". centercityphila.org. Retrieved 2018-05-10. ^ Patten, Zach (2013-09-13). "Rally for the Rail Park to Fundraise for Philly's Own High Line". Curbed Philly. Retrieved 2018-07-02. ^ "The Park | Friends of the Rail Park". Friends of the Rail Park. Retrieved 2018-05-10. ^ "The long-awaited Rail Park is finally here". Curbed Philly. Retrieved 2018-05-10. ^ "Long-awaited Rail Park opens first phase". Curbed Philly. Retrieved 2018-06-26. This page was last edited on 7 March 2019, at 22:34 (UTC).